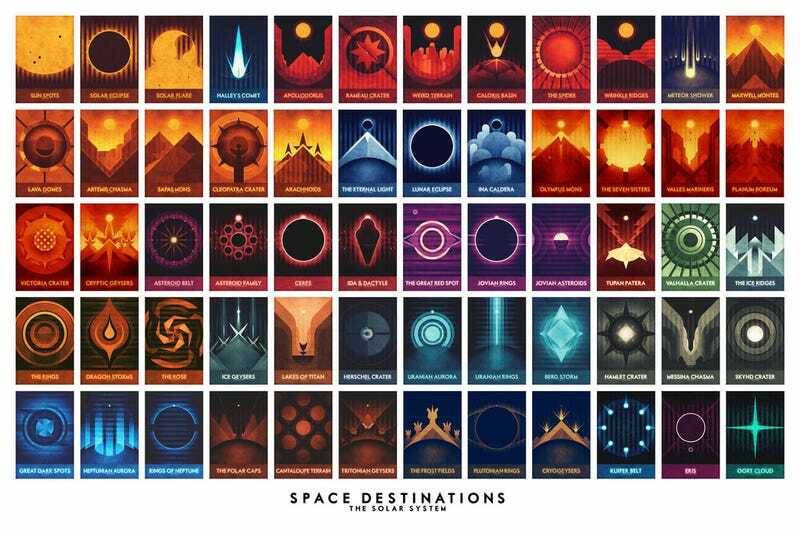 Ron Guyatt started his Solar System travel posters project a few years ago with locations on Mars, and he has since branched out to create a master work highlighting the best our Solar System has to offer. Space tourism is still a long ways off, but it's not hard to imagine that someday, tourists will visit the natural geological landmarks of other worlds much like they tour the Grand Canyon, Mount Everest or Ayers Rock. Each of these great tourist destinations needs a classic retro travel poster to entice visitors. Until the day people settle off world and make their own destinations many of these may be the places that people will want to travel too. I hope that these posters can inspire people to think beyond our world to the limitless possibilities of the Universe. You can check out the rest of his gorgeous collection here as well as browse his other works. Definitely one of the best poster designers on the internet. His Batmobile posters... wow. Prints are also available for those who want to bring a bit of the Solar System into their homes. And really, who doesn't?